I have to report that I'm not making much progress toward my aim of writing about my Wanamaker ancestors. Too much of my time has been taken up with totally unrelated stuff recently, and when I got back into genealogy mode a few days ago, I got sidetracked right away, by good old George Cockram. 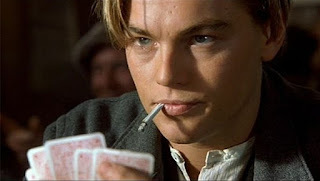 The trouble is, we watched the movie 'Titanic' on TV, in which our hero Jack Dawson (played by Lenny Cappuccino, as we like to call him) acquired his ticket for the doomed journey by winning it in a poker game, so of course it had someone else's name on it. Aha! Could that be how George became Thomas Smith, I wondered? Was he a gambler, intently poker-faced in a dark smoky pub in Plymouth or Liverpool, staking everything on one last hand, and winning Thomas Smith's ticket to Canada on the Dominion? Well, it's a thought, but all of my instincts tell me it didn't happen that way. Surely George wasn't a gambler ... or was he? And then there's the question of where George, Louisa and their daughter Audrey were when the 1921 Canada census was taken. I read an article with several reasons why people don't appear on censuses, and the one that grabbed my attention was this: Census data wasn't all collected on one day, and if a family was moving to a different house during the period when the census was being taken, they could have missed the enumerator's knock on the door in both locations. George et al did move at around that time - I don't know exactly when, but their absence from the census could be the clue that answers that question. If their new address was enumerated shortly before they moved in, and their old address shortly after they left, that would certainly explain why there are two other families at those addresses on the census, and why George, Louisa and Audrey can't be found. I did get around to looking at some Wanamakers and McConnells, and was soon embroiled in a huge tangle of these two massive families. Did I mention earlier that both of these families kept using the same first names over and over and over again, deliberately making things very difficult for me? How many Harmanus Wanamakers and Thomas McConnells can there possibly be? Too many, that's all I know. But leaving that problem aside, I need to find a focus for these two families. They both go back a long way, and their early history in America interests me, but I know that it might not interest you - you want to hear about more recent people, right? Well, I'll get to them, but I think I won't be able to resist banging on about some ancestors from the 17th and 18th centuries first - if I ever get them untangled. For now, I'll just remind you how I'm related to these families - my great-grandfather William Wanamaker married Alma McConnell in Ontario in 1888. But long before that, their ancestors migrated to America - the Wanamakers from Germany, and the McConnells from Scotland via Ireland. I don't know when or how these two families first met each other, but in my mind, they come together in the 1770s, the time of the Revolutionary War in America - and that might be my starting point when I finally get ready to write about them.